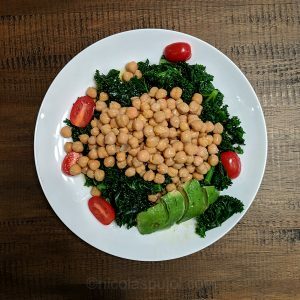 I only had a few minutes for this garbanzo bean and kale salad and it turned out to be a fitting recipe. So I am sharing it here with you. Time is a scare resource: we only have 24 hours in the day do it all. 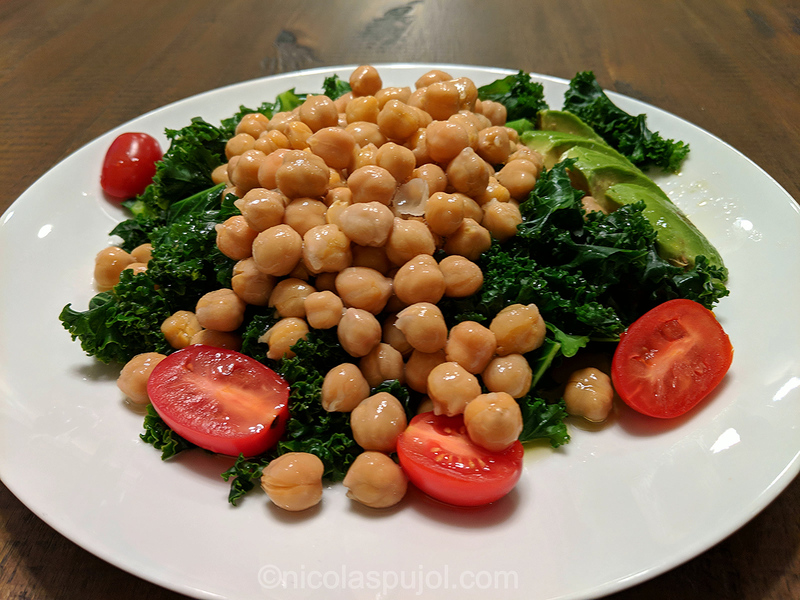 When on a busy day, it is possible to make a quick and nutritious lunch, and this was the driver of this garbanzo beans and kale salad. The entire process took under 10 minutes from start to finish. All you need is to have the ingredients at your disposal. I started with the kale, and felt that if this was going to a full meal it would lack a few calories. It had been a while since eating garbanzo beans, which make for tasteful salads while bringing a good load of quality carbohydrates. The addition of a quarter avocado and a few small tomatoes rounded up the colors. “Eat the rainbow”, some say when referring to colorful vegetables and fruits. You can put salt as you feel, I did without salt for this meal and sprinkled the juice of half a lemon as well as olive oil. The garbanzo bean and kale salad is ready. This recipe can be an excellent salad for the fast mimicking diet (FMD), as it is plant-based and contains a balanced amount of complex carbohydrates, fats, and a little bit of proteins. Cut the kale in small chunks and place in a large pan with a base of boiling water. Slow cook for 5 minutes. During this time, open the beans and squeeze the lemon. Strain the kale, place it on a plate with the quarter avocado on the side. Add the beans, sliced tomato(es), then sprinkle the olive oil and lemon juice on.